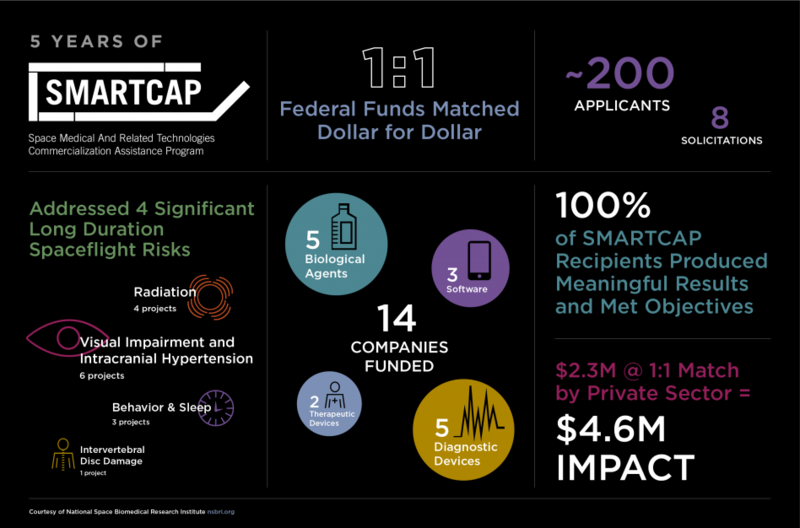 The SMARTCAP project was designed to build on the company’s on-going efforts and existing commercialization strategy. At the same time, the new work enables the pursuit of expanded market opportunities via projects that address both space exploration demands and terrestrial market applications. The Industry Forum continues to works closely with successful candidates to develop work plans that aligned with both the terrestrial and space applications of the product. Below is a snapshot of the SMARTCAP accomplishments to date. Download a brochure of the program here. Developed the SleepFit app and partnered with Schneider Trucking, leading to nationally recognized follow-on studies to assess fatigue in long-haul truckers. App creation & validation led to significantly reduced testing times. SleepFit creates safer roadways by helping drivers assess fatigue. Funded development of the programmable sleep mask to first generation commercial device. By shifting the circadian cycle, LumosTech’s smart sleep mask will help ensure that astronauts are at peak performance for a scheduled task. Shifting one’s circadian cycle may significantly improve alertness, enhancing safety on the highways, in the skies and in hospitals. Enabled Pear to fast-track development of its insomnia product. Pairing of zolpidem and targeted app will help astronauts manage sleep-wake cycles ensuring alertness for mission critical tasks. Millions of sleep-deprived people will be able to improve their sleep hygiene. Performed groundbreaking studies in mice undergoing proton irradiation. enterade® has the potential to mitigate GI toxicity following radiation exposure. enterade® helps alleviate radiation-induced gastroenteritis in oncology patients, allowing for more effective treatment. Developed a gel formulation of its MatriStem® product, leading to an issued patent and development of a novel wound healing animal model. 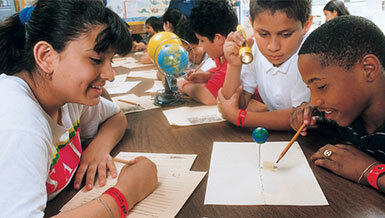 Useful to promote healing in the microgravity environment where wounds and abrasions are slow to heal. Will help doctors treat deep, irregular wounds. Funded refinement of prototypes and early efficacy studies. Validation of the technology helped the company raise a five-fold match of the grant amount. Equinox’s Balance Goggles may prevent ocular changes by normalizing the pressure gradient between intracranial pressure and intraocular pressure. Millions of glaucoma patients worldwide may benefit from this alternative therapeutic approach. Supported a clinical trial that demonstrated efficacy and the acquisition of another system enabling doctors to evaluate 1,000 soldiers. This device will: 1.) significantly improve diagnosis and tracking of head trauma patients and 2. )remove subjectivity from “return to activity” decisions. Supported evaluation of multi-spectral imaging technology to deliver insights on VIIP Syndrome and identified new applications in neurology and neuro-ophthalmology. Earlier detection of retinal anomalies may provide insight into VIIP Syndrome and its impact on visual acuity, eye shape and retinal changes. Early detection of retinal changes will enable ophthalmologists to address problems sooner, leading to better outcomes. Supported clinical research and the development of key algorithms for the device which served as early stage validation of the company/technology. Offers non-invasive monitoring of changes in intracranial fluids (ICF), expanding our understanding of microgravity’s effects. This non-invasive monitor may improve outcomes for acute stroke and TBI patients by enabling early intervention in cases of worsening edema. Funded a deep dive into novel approaches in miniaturized vision testing equipment and adjustable power eyeglasses. NASA is now evaluating adjustable power eyeglasses & miniaturized vision testing equipment from companies identified & qualified by Web Vision Centers. Adjustable glasses represent a significant improvement over bi/trifocals. Supporting development of a lens that can be programmed with far, near and mid-range sections or a single focal length. Electronically adjustable lenses will enable astronauts to adjust their lenses to match the visual demands of the task. Accommodating contact lenses, virtual and augmented display optics and dynamic adjustable eyeglasses will enhance visual acuity. Funded further development of the device to expand utility and a clinical trial to evaluate efficacy in addressing back pain similar to that experienced by astronauts. Wearable ultrasound device may alleviate back pain/discomfort for astronauts while in space and upon their return to Earth. Sam® is used for treatment of muscle injuries and. to help injured workers return to work more quickly.